Patriotic ceremonies at halftime of sporting events may not just be about honoring the troops. Some of those tear-jerking moments honoring U.S. heroes are "paid acts of patriotism," ABC News has learned. The Pentagon buys on-field opportunities for military men and women to carry as part of marketing and advertising packages with more than 50 professional sports teams. Arizona's two Republican senators said Wednesday that the Defense Department spent more than $10 million in marketing and advertising contracts with professional sports teams between 2012 and 2015. A new report by Sens. John McCain and Jeff Flake, titled "Tackling Paid Patriotism," calls for an end to the taxpayer-funded practice of sponsoring such military celebrations at games, an effort that is often used for recruiting efforts and community outreach. 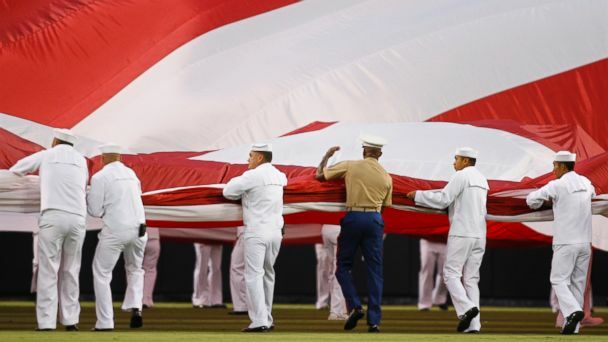 The report found 72 contracts in which the Pentagon paid for patriotic tributes at professional sports games. "These teams do a lot of good work," Sen. Jeff Flake, R-Ariz., told ABC News. "The problem is when activities like this are paid for by the tax payer, it cheapens everything else they do and that's why it ought to go away." The report names a number of Texas teams. It says in 2013, the Houston Astros took $25,000 and the Houston Dynamo took $15,000. The Dallas Mavericks took nearly $27,000 over two years, and the Dallas Cowboys took $262,5000 taxpayer dollars over three yeras. Other examples mentioned by the report include the Army National Guard paying the Minnesota Vikings football team to sponsor its military appreciation night; the Air Force paying the Cincinnati Bengals football team $4,960 for 60 club level tickets; and the Air Force paying the LA Galaxy soccer team for "recognition of five high ranking officers of the Air Force" in a 2012 game and four sideline season tickets. The leagues and teams deny they charged for patriotic displays, saying these events were free add-ons to big marketing contracts. And the Department of Defense told ABC News that military tributes, such as color guards, military bands and troop formations, are a "no-cost addition to the agreements." The senators noted that much of this money was paid out as the military asked Congress for additional dollars. The report said the ceremonies should be genuine displays of national pride, not taxpayer-funded marketing gimmicks. MLB commissioner Rob Manfred told ABC News, "we've gone to the clubs and we've encouraged them to take steps to avoid any appearance that they're being paid for any ceremonial, patriotic activities on the field." The NFL also says it is launching an independent audit to see whether their contracts included money for patriotic moments. If so, the NFL says it will work to refund those taxdollars.